Everyone knows what a Snickers® package looks like. By using the same graphics on the package but changing the word "Snickers" to another word or phrase, the consumer is forced to assemble a new equation. 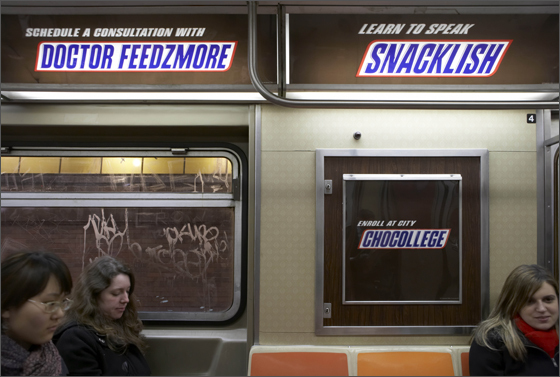 Not only are consumers forced to interpret the Snickers® package correctly but also to make a new association with it. While any New York pedestrian would most likely connect "Feast Village" to New York's East Village, ultimately the ad says nothing about the East Village. What these ads get at is brand recognition; they speak for themselves. The phrases and words are also rather memorable; it wouldn't feel all too out of place to fit a little "Snacklish" into your lexicon. So, what do you think of this campaign? Do you crave a Snickers® bar after seeing this or does the subtle message drown out your interest before your mouth waters for a chocolate-peanuty-caramel delight?